In addition to serving students, the Foundation also supports the needs of teachers, pastors, rabbis, and other educators in delivering small-group Bible education in a methodical, in-depth manner. Beginning in 2007 with a single website, Psalm11918.org, our efforts have expanded to seven different sites each focused on different audiences and subjects. 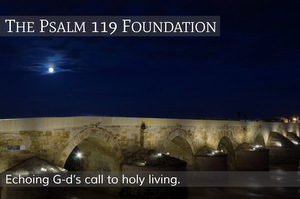 The Psalm 119 Foundation was formed to provide consistent, G-dly direction and executive oversight for the expanding scope of our efforts to ensure that you, our readers, receive the greatest possible benefit. All of these efforts align with our heart-felt motto: echoing G-d's call to holy living.